Open a FREE TimeToTrade account today and create and customise your own Price, Candlestick Patterns, Trend Line, Volume and Technical Analysis alerts. 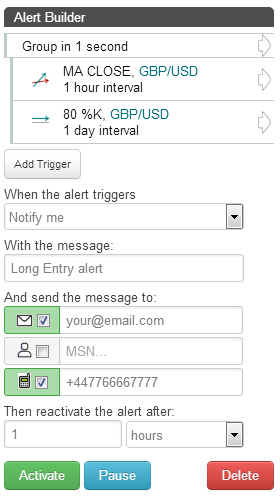 Alerts can be sent by email or SMS text to your mobile the instant your charts alert conditions are met. Free Real Time Market Data available for Forex, Precious Metals and a range of Stocks. Setting up your Price, Candlestick Patterns, Trend Line, Volume and Technical Analysis Alerts is easy. There are no programming languages to learn or complex macros to write or formulas to code. 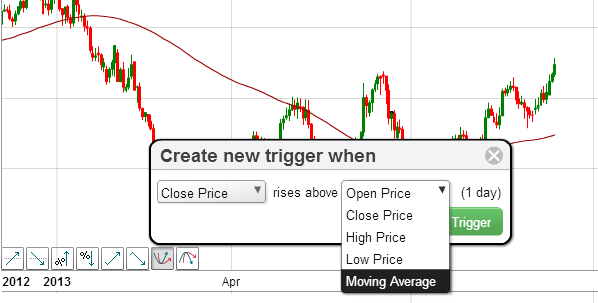 Just go to your personal TimeToTrade chart page and click on the Alert Triggers to start building your alerts. The next time your investment conditions are met, this will trigger the alert to be sent to your mobile phone or email account.